We are dedicated to seeking knowledge and innovation to provide adequate and sustainable nutrition to an increasing world population. Our fisheries research supports the long-term sustainable harvest of wild marine resources. Our aquaculture research is aimed at delivering significant increases in production while minimising environmental impacts. 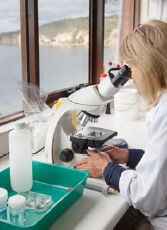 Our extensive international research capacity in fisheries and aquaculture is greatly enhanced by our key collaborative partnerships and the development of cutting-edge technology. With a focus on temperate marine environments, our knowledge is fostered and passed on to the upcoming generation of scientists, industry leaders and policy makers.